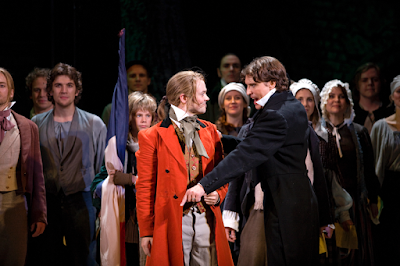 An interview with Rune Sæter - ÅST's Enjolras during the 2010 and 2011 seasons and currently teaching musical theatre in Bømlo, Norway. Let's start with a little background! Where have you studied? "I went to Mountview Academy of Theatre Arts in London for three years (1999-2002) - the same course as Josefine Isaksson, who plays Éponine. A couple of years ago I also studied to become a teacher in drama. Musically I'm hugely influenced by gospel, soul and jazz, although these styles are quite far from the style in Les Misérables... When it comes to musicals, I would say that rock musicals favour my natural voice." What are the most important roles of your career so far, and which one have enjoyed doing the most? How does Enjolras situate on that list? "Judas (Jesus Christ Superstar) is my favourite role. Musically it's almost perfect for me, and acting-wise he's a great character to portrait. I would love to do that part again. Claude (Hair) was important to me because it was the first time I got a leading role at an influental large theatre in Norway (Det Norske Teatret in Oslo). Playing Che (Evita) at ÅST was a superb experience, and I realized how important it is to work with people with great acting abilities, like Birthe Wingren, who played Evita. It was also the first time I worked with Sören Lillkung [Javert] and Thérèse Karlsson [Fantine], people I respect highly regarding their professionalism and talent. On the positive side is the fact that Enjolras must be played by someone with great presence and charisma, and I do think that I possess some of those qualities. You certainly do not learn when things come easily, so in that sense this has been a great experience for me. Also, the fact that so many people are touched by the story in Les Mis makes it motivating to play." What are your favourite musicals, and is Les Mis one of them? "I think Les Mis is one of the strongest musicals when it comes to the story, and the music is supporting it beautifully. My favourite musicals at the moment are RENT, Jesus Christ Superstar (because of Judas) and Wicked. I would love to see The Book of Mormon, Avenue Q and Next to Normal, because I truly think I would love them. For me, the story and subject are important in a musical." 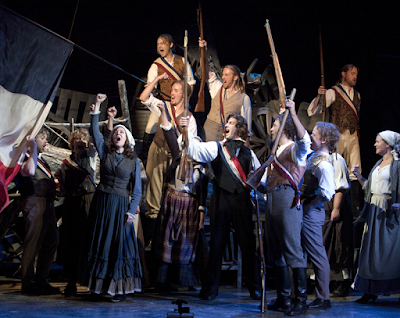 Who's your favourite character in Les Mis? "I think Javert has some interesting aspects. Valjean is a demanding role, but I choose Javert." How about favourite song or scene? "Bring Him Home, a highlight, done beautifully by Alexander Lycke! One Day More also." Have you seen other productions of Les Mis? If so, how do you think the ÅST version compares to them? "I saw a production in Oslo a couple of years ago, and I was disappointed. It's not easy being too critical towards your colleagues, but I do believe ÅST has succeeded finding great actors and singers for every role. ÅST's production is balanced and strong." How do you see the character of Enjolras? What are your sources of inspiration for playing the part? "The most important thing for me has been making him a natural leader. He must be a person the others look up to and trust. A person with vision and strength. I know that my version of Enjolras is slightly different from the one in the original book, but I truly believe he has the same backbone. Enjolras has been done in so many ways. Some make him beautiful and charming, singing him with a lyrical quality. For me, it's important to make him not so pretty and 'well sung'. He is strong, but broken. Charismatic, but also sensitive. The relation with the students is very important, without them he is nothing. He is the opposite of selfish, being the voice of the people in difficult times. My sources of inspiration lies in the work with my fellow actors. Creating scenes by giving and receiving. You have to trust your colleagues, and what they bring to the table, of course seen in the light of the original script and book." What have been the best moments during your time working in this production? "The best moments are magical moments happening on stage." Care to share any silly mistake you've done? "Well, I've been working professionally for ten years, and for the first time it almost happened that I didn't get on stage in time. I was saved by the great Valde Wallenius who caught me wandering about in my own universe when I was supposed to get ready for a slow motion sequence in Empty Chairs at Empty Tables. Thanks, Valde!" How has working in ÅST, and Finland in general, been like? "It's been a tremendous experience, and a bit of my heart lies pounding in Finland. I like the Finnish down-to-earth working morale." 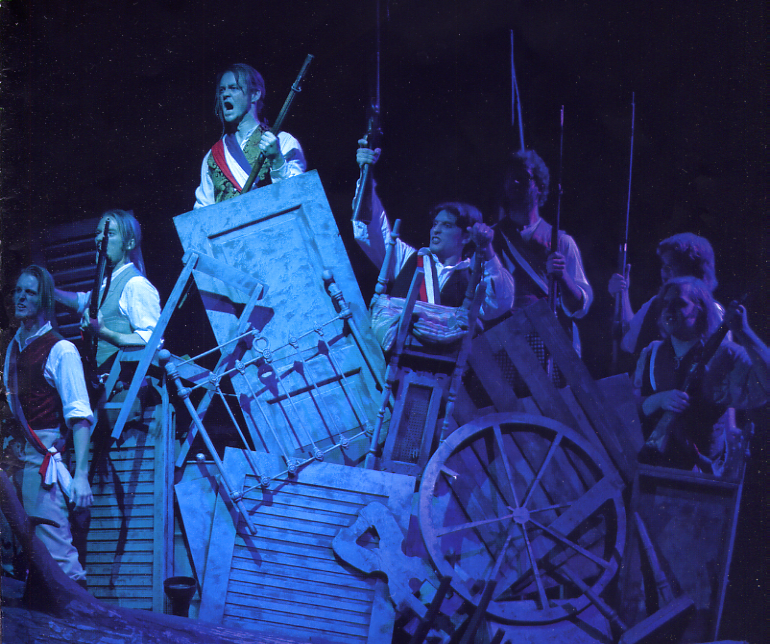 If you got the chance of being a part of another production of Les Mis one day, would you, and who would you like to play that time around? "I don't see myself playing a different character, mostly because of the limitations in my physical being. If I was to choose, it would be Javert." How about your non-Les Mis dream roles for the future? "Judas with great cast members! Perhaps Angel or Tom Collins in RENT." How do you feel like about leaving the production? "Leaving the production is of course a little sad, but life goes on, and I couldn't have done Enjolras at ÅST for the rest of my life. I bring with me good memories." Pictures by Nana Simelius and Robert Seger, from Åbo Svenska Teater's press photo site and the programme for Les Misérables. Mahtavaa, että pääsit haastattelemaan Runea :) Kiva haastattelu!